I fly a fair amount for work. Yesterday, I was in a TSA line near an Orthodox Jewish man wearing a yarmulke. I was dying to know if they made him remove his lid. I mean, we're in the deep south - do they know that's bad juju? I never found out - two lines diverged in yellow terminal - and I took the one less populated by elderly and slow people - and that made all the difference. Anyway, once I got to the terminal, I saw another figure of interest. Flying Nun? Sister Bertrille, is that you?? 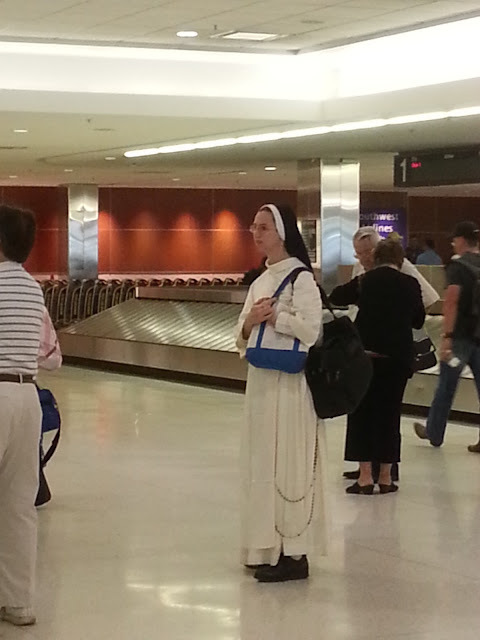 The Lord would be a real jerk to smite a flight with a nun on it. I also love seeing a plane full of orphans. Makes up for my rotten Karma. I was trying to be all stealth taking this pic. My colleague asked what I was taking a picture of. I answered, "Noneya." As in, "None ya damn bidness." I sent the image to a friend who said, "Nice Penguin." I love that my friends say the things that pop into my head.